Video conferencing has been around for decades, but it is enjoying an uptick in popularity as technology improvements and business conditions make it ripe for deployment. 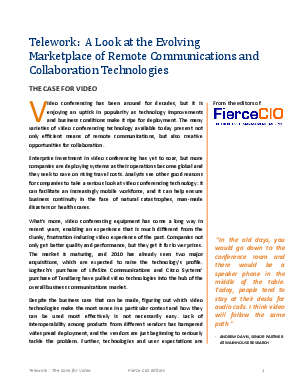 The many varieties of video conferencing technology available today present not only efficient means of remote communications, but also creative opportunities for collaboration. Enterprise investment in video conferencing has yet to soar, but more companies are deploying systems as their operations become global and they seek to save on rising travel costs. Analysts see other good reasons for companies to take a serious look at video conferencing technology: It can facilitate an increasingly mobile workforce, and it can help ensure business continuity in the face of natural catastrophes, man-made disasters or health scares.